Audi 4000 Quattro Timing Belt Replacement at your home or office. Audi 4000 Quattro Timing Belt Replacement costs $547 on average. What is a timing belt and how does it work? An engine timing belt is a fiber reinforced, toothed drive belt manufactured using durable compounds such as highly saturated nitrile. 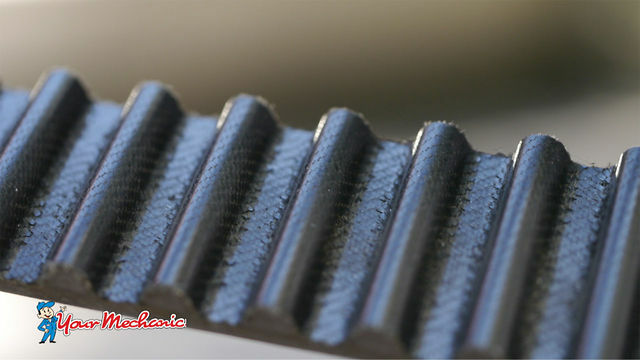 The timing belt allows the crankshaft to drive the camshafts in the cylinder head at half the RPMs of the crankshaft. The camshafts then open and close the engine’s intake and exhaust valves in time with the movement and position of the pistons in the engine. Every 60k-90k miles. If an engine is equipped with a timing belt, the timing belt must be replaced at the service interval specified by the vehicle manufacturer regardless of whether or not any problem is visible, typically in the range of 60,000 to 90,000 miles. Your vehicle owner’s manual should state the specific service interval. Engine stops abruptly or will not start. Occasionally, timing belts can break, or skip, while the engine is running. Rough engine operation. The molded, reinforced teeth on the timing belt engage gears on the crankshaft and camshafts. After many tens of thousands of miles, the teeth can wear or break, or the belt can stretch, thus causing the belt to jump position on the crankshaft or camshaft gears. Should the belt jump, the engine will run poorly and perhaps not at all. Banging or clanking engine noise. On some engines, if the timing belt has jumped, the pistons and valves can collide and there will be noise and damage. These engine designs are referred to as interference engines. If your car has an interference engine, replacing the timing belt according to the maintenance schedule will minimize the chance that a belt failure will cause engine damage. How do mechanics replace the timing belt? Once the engine is cold, set the crankshaft to top dead center with the number one piston on the compression stroke. Remove crankshaft pulley. Remove all accessories interfering with the removal of the timing belt covers. Remove timing belt covers. Lock camshafts, as required, and note position of camshaft timing marks. Remove timing belt tensioner and idler pulleys. Remove timing belt. If replacing the water pump, do so at this time, and of course drain the cooling system first. If the engine cooling system thermostat is only accessible with water pump replacement, the thermostat should be replaced as well. Installation of the new timing belt includes all of the above steps, performed in reverse, following strict guidelines to assure camshaft and crankshaft (and balancing shaft, if equipped) are in perfect alignment after tensioner has been set. Upon completion of the installation, the engine crankshaft is turned by hand 720 degrees and the correct position of the timing marks on the crankshaft and the camshafts is confirmed. The vehicle is road tested to confirm normal operation and a service sticker is affixed to the engine noting the date of belt replacement and the vehicle mileage. Is it safe to drive with a timing belt problem? No, were a worn out timing belt to snap while underway, perhaps on a highway, it creates a risk of complete loss of engine power while surrounded by fast moving vehicles. Once your vehicle has reached the recommended replacement mileage for the belt, you can eliminate the risk of sudden and unexpected timing belt breakage by having it replaced. If your engine is of the interference type, it is especially important to replace the belt according to the maintenance schedule because sudden breakage of the timing belt, while the engine is running, will likely cause significant damage to internal engine components such as the valves and pistons. An interference engine should be carefully inspected before a broken timing belt is replaced because it may have sustained damage that will have to be repaired prior to installing a new belt. The timing belt system includes idler pulleys and a belt tensioner. These components should be replaced along with the belt. On some cars, the timing belt drives the engine’s water pump. Mechanics will usually recommend replacing the water pump at the same time that the timing belt is replaced.